It is very easy to use baking soda to address various health conditions. You can create a baking soda paste with some water and essential oils to exfoliate dead skin cells, soothe itchy skin, or treat canker sores. Drinking baking soda can also be good for some health conditions. To create baking soda water, you just need to add ¼ to ½ a teaspoon of baking soda and mix with a glass of water. In this article, you will learn about the many uses of baking soda, or bicarbonate of soda. You will also find out how to use baking soda on your skin, internally, and to keep your home clean. Around the home, baking soda is used as a raising agent in baking. The fact that baking soda has a coarse texture, a deodorizing effect, and has antimicrobial properties, means that it is an effective cleaner in the kitchen and bathroom. It is important not to confuse baking soda with baking powder, even though both ingredients can be used in cooking. Baking soda (sodium bicarbonate) is just one ingredient with the chemical name NaHCO3. While you can use both baking soda and baking powder in cooking, only baking soda has the many health benefits that are discussed in this article. Let’s look in more detail at how you can use baking soda to address and treat a number of health issues. The gentle abrasive properties of baking soda along with its antimicrobial effect makes it a great natural product to use for brushing your teeth. Cleaning your teeth with baking soda can make them whiter because its gentle cleansing effect also helps to remove stains. Making your own baking soda toothpaste to use for cleaning your teeth will not only remove bacteria from your mouth but leave your mouth feeling refreshed. You can make a natural baking soda toothpaste by combining 2 tablespoons unrefined virgin coconut oil with 2 tablespoons baking soda. Put a small amount on your toothbrush and brush your teeth for 2 minutes as you would with regular toothpaste. Rinse and spit at the end. To make a natural tooth-whitening paste, make a thick paste using a tablespoon of baking soda and a small amount of food grade 3% hydrogen peroxide. Put a generous amount on your toothbrush and brush for 3-5 minutes to help remove stains from your teeth. Rinse and spit at the end. Although using these sodium bicarbonate kinds of toothpaste is a completely natural way to clean your teeth, you should avoid swallowing any of the natural paste. Find about other ways that coconut oil can help improve your dental health and how to get sparkling white teeth at home. Another way to use baking soda to improve your dental health is to rinse your mouth with baking soda water. A baking soda mouthwash is great to use for your teeth and gums because its alkalinity reduces acid in your mouth. This helps to lower your risk of gum disease and tooth decay and also helps to treat bad breath. 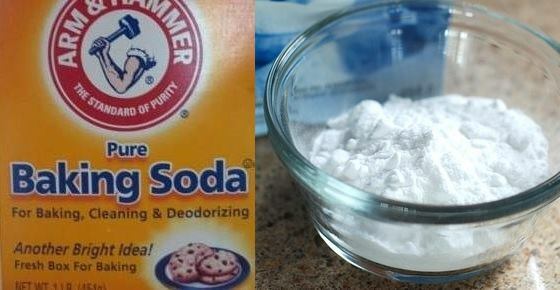 Make your own baking soda mouthwash by mixing 1/2 teaspoon baking soda in half a cup of water. Swish the natural mouthwash around your mouth for 30-60 seconds. This will help to kill off bacteria, help prevent plaque forming, and lower your risk of gum disease. Find out other ways to use this sodium bicarb mouthwash to treat gum infections and reduce inflammation in your gums. Pure baking soda is also good for helping sores on your lips, gums, or roof of your mouth to heal quicker. Mix a teaspoon of baking soda with a little water to make a thick paste. Use a cotton bud to apply the paste to the canker sore to help it heal quicker. Leave for a few minutes (it may sting, but this is normal) and then rinse off. Apply a few times throughout the day to help get rid of your canker sore quickly. Learn about other home remedies you can use to get rid of mouth ulcers including fever blisters, mucous cysts, and burn blisters. One of the most common uses of baking soda is to relieve the burning sensation in your chest that is the result of heartburn. Heartburn (acid reflux) occurs when acidic juices from the stomach escape back up the esophagus causing irritation. How effective is using baking soda for heartburn? When discussing effective treatments for acid reflux, the medical publication StatPearls says that many patients use baking soda for effective heartburn relief. (9) The alkaline effect of baking soda helps to neutralize the acid in the esophagus. To help relieve the symptoms of heartburn, all you have to do is mix some baking soda and water. Put ½ teaspoon baking soda in an 8-oz. glass of water. Mix until completely dissolved and consume slowly. Use this baking soda remedy to help get relief from heartburn (acid reflux). Because baking soda is high in sodium, you shouldn’t use baking soda to relieve chronic heartburn or gastroesophageal reflux disease (GERD). The maximum safe dose of baking soda is 7 dosages in a 24-hour period. For more information on how to prevent heartburn, please read this article. You can also use baking soda and water remedie to help treat other digestive complaints such as peptic or gastric ulcers. Mix about ½ teaspoon of sodium bicarbonate in an 8-oz. glass of water. Drink the baking soda water after each meal to help calm your stomach and prevent a burning stomach sensation. There are more natural remedies for gastric ulcers such as aloe vera, probiotics, and apple cider vinegar. Baking soda is also good for helping to alleviate some of the symptoms of a urinary tract infection. UITs often cause urine to become more acidic and that can lead to a stinging sensation when you pee and a frequent need to urinate. To use baking soda and water to help alleviate the discomfort of a UTI, mix 1 teaspoon of baking soda in a large glass of water. Drink the baking soda water 2 or 3 times a day up to 3 days. Learn more about proven natural methods of treating a UTI and when you should see a doctor for your symptoms. The alkaline effect of sodium bicarbonate (NaHCO3) can help to lower inflammation in the body. To help reduce the effects of inflammation, consume a glass of water and ¼ teaspoon baking soda after a meal twice a week. Continue to use the anti-inflammatory baking soda remedy for no longer than 4 weeks to help with inflammation. Learn more about how drinking baking soda water can help remedy a number of health issues, not just inflammation. Because sodium bicarbonate naturally kills off bacteria, you can use baking soda to make your own homemade deodorants. You can use baking soda together with coconut oil to create a bacteria-killing deodorant that has a natural pleasant aroma. To use baking soda as a natural deodorant, mix 1 tablespoon baking soda with a ¼ cup of coconut oil and add 3 drops of lavender essential oil. Store in a clean glass jar and apply a little of the baking soda deodorant to your armpits daily after showering. Drinking baking soda and water also benefits your energy levels as it can help to increase performance during intense physical activity. Mix ½ teaspoon of baking soda in a large glass (8 oz. or 250 ml) of water and consume about an hour before starting to exercise. Make this mixture which contains baking soda and water for rehydration, for example after diarrhea or endurance sports. To make your own homemade isotonic drink using baking soda, mix the following: 1 liter water, ½ teaspoon baking soda, ½ teaspoon table salt, 2 tablespoons honey (you can tweak the amount of honey you want to include and add your own flavors) and drink to replace lost fluids and essential minerals after training or working out at the gym. Using baking soda to increase exercise performance also has the added benefit that the baking soda drink can prevent painful muscles after exercising. Consume a glass of baking soda water an hour to 1½ hours before starting an intense physical workout. Using baking soda to boost exercise performance also has the effect of helping to rehydrate you and prevent electrolyte loss due to excessive sweating. Learn about other natural remedies to alleviate muscle soreness in general or after physical activity. Adding baking soda to bath water can be an effective way to alleviate irritation and itchiness from your skin. Mix a little water with a tablespoon of baking soda and apply to the patch of itchy skin or insect bite that itches. Leave for 10-15 minutes before rinsing with cool water. Alternatively, you can use baking soda in your bath water to get rid of itchiness from your skin. Add a cup of baking soda to warm water in your bathtub and soak for 20 minutes to help soothe skin irritations. Learn about other natural ingredients that are good for adding to your bath to relax and rejuvenate your skin. If you suffer from chronic itching skin, find out what else you can do to relieve skin irritation naturally. You can also use baking soda on your skin to help reduce the severity of sunburn and help soothe irritation, redness, and itching. You can use baking soda as a good way to soothe the symptoms of sunburn as directed in the “itchy skin” section. For a small patch of burned skin, apply a baking soda paste to the affected areas. If a larger area of your body has been affected by sunburn, then taking a baking soda bath will help to relieve the soreness from damaged skin cells. Learn about other natural ingredients you can use to get rid of sunburn and sunburn blisters faster. Baking soda is also good for your skin if you suffer from acne outbreaks or other oily skin conditions. Use baking soda as an anti-acne facial mask by mixing 2 tablespoons baking soda, 2 tablespoons water and 4 drops of tea tree oil. Apply to your face after cleansing and leave for 10 minutes to help reduce the number of acne-causing bacteria. Rinse off with warm water. You can also apply a baking soda and water paste as a spot treatment on larger pimples to help reduce inflammation and shrink the size of the pustule. Find out about the many other ways to use baking soda to treat acne and pimples. You can read the full details in the article: How To Fight Cold and Flu With Bicarbonate of Soda (Baking Soda). Another use for baking soda on your skin is as a gentle cleanser to remove dead skin cells and unblock pores on your skin. Baking soda has a natural grainy texture that makes it perfect for exfoliating skin and normalizing pH levels due to its alkalinity. Mix 2 tablespoons of baking soda, 2 tablespoons of fine brown sugar, and ¼ cup of lemon juice in a bowl and mix well. Apply to cleansed, damp skin using gentle circular motions to remove dead skin cells. Leave for 10 minutes and rinse off with warm water. You can also make a baking soda exfoliation mask by combining equal amounts of coconut oil and baking soda. Use as directed above. Find out many other recipes that incorporate baking soda and can help to keep your skin looking gorgeous. One of the most common uses of baking soda around the home is to clean grime and dirt from kitchen and bathroom surfaces. Baking soda is useful around the home because it is non-toxic, environmentally-friendly, and very cheap to use. Many experts also agree that simple baking soda is good for keeping your home clean. Here are some ways that you can use baking soda around the home. Baking soda is a good natural scouring agent that effectively removes sticky grime and grease from your oven without chemicals. Make a thick paste with baking soda and water and spread the mixture around your oven. Leave for an hour and use a warm damp cloth to wipe off the grime from your oven surfaces. Spray white vinegar on areas where baking soda residue remains and wipe with a damp cloth to get your oven looking like new. Mix some baking soda powder with water to form a cleansing paste and use to clean kitchen surfaces, sinks, chopping boards, or remove grime from your bath. Some people recommend to sprinkle generous amounts of baking soda powder on your carpet and allow it to sit overnight to get rid of bad odors. However other people suggest that vacuuming the baking soda from your carpet could damage the vacuum cleaner and you shouldn’t do it. Using baking soda together with vinegar is an eco-friendly way to help unclog drains and remove drain smells. To use baking soda as a drain cleaner, first of all, pour a pot of boiling water in the drain. Pour ½ cup of baking soda and leave it to sit for 5 minutes. Then pour a cup of white vinegar in the drain followed by a cup of hot water. Cover the drain and leave for 10 minutes. To remove the last of the grime, flush with a pot of boiling water. Many people use baking soda in their refrigerator to remove strong smells. It couldn’t be easier to use baking soda to keep your refrigerator and freezer smelling great. Put an opened box of baking soda in your refrigerator to control strong odors for up to 3 months. There are many other ways to use baking soda to improve your health. For example, you can use this mixture of baking soda water to make alkaline water. Use these recipes containing bicarbonate of soda to fight acne and pimples. You can also find out detailed instructions on how to use baking soda for gorgeous face and skin. Although baking soda is a completely natural product with many uses in healthcare and around the home, you should still take some precautions when using it. If you use baking soda for heartburn, you should limit the dose to 5-7 glasses a day of baking soda water and not use the remedy for more than 7 days. However, people over the age of 60 are advised only to use baking soda remedies for up to 3 days due to the high sodium content. You should also avoid getting baking soda powder in your eyes as it may cause irritation. Some people with sensitive skin find that they cannot tolerate baking soda on their skin. In this case you should consider trying a small ‘patch’ test before using baking soda on large areas of skin. If you are on a sodium-restricted diet, you should avoid using baking soda remedies.